Hiring local contractors to support the construction of Ross River Solar Farm will inject substantial funding into the local Townsville economy. Where possible, we employ Australian workers with the right skills to work alongside our specialist project teams and operations staff. We also try to support the economic growth of the region by ensuring money we spend on services goes to local businesses in the immediate area or from within Australia. 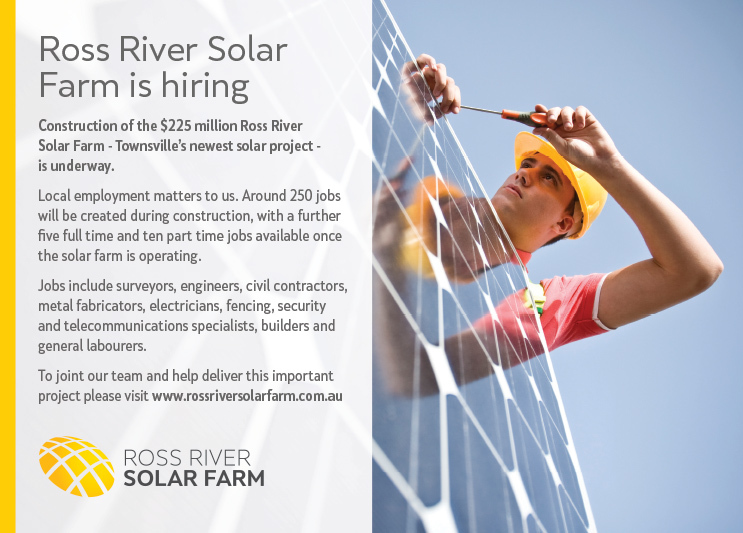 Hiring local contractors to support the construction of Ross River Solar Farm will inject substantial funding into both the Townsville and wider-Australian economy. To date, over $15 million has been invested through the hire of local businesses. Up to 250 jobs will be created during construction, with a further five full time and ten part time ongoing jobs available once the solar farm is operating. Jobs will include surveyors, engineers, civil contractors, metal fabricators, electricians, fencing, security and telecommunications specialists, builders and general labourers. Recruitment has targeted local employment forces to ensure we have a pool of appropriately skilled workers to work alongside our specialist project team and operations staff. While all major tenders are now complete, some opportunities for smaller contracts and individual positions are still available. Individuals or companies that would like to express interest in these opportunities can contact us by email here. Since commencing operations for the Ross River Solar Farm Project in August 2017 the Northern Logistics & Warehousing business has grown from two base warehouses to add five temporary warehouses with the company now searching for our 8th warehouse facility. This increase in business has given Northern Logistics & Warehousing the ability to grow its workforce by approximately 130 percent. The business had spent several years preparing for growth which proved invaluable following the rapid increase in its operations over a very short period of time.